Crta. 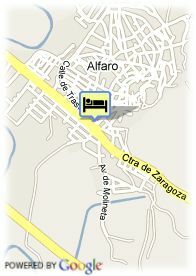 Zaragoza, s/n, 26540 Alfaro, Spanje. 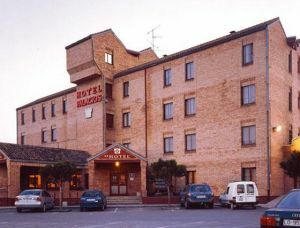 Quiet hotel in La Rioja.The Palacios Hotel is a comfortable establishment located in the Alfaro entrance, beautiful place from La Rioja. The hotel is situated in a quiet and pleasant area, and very close to the main touristic destination of the city: the Saint Michael Collegiate Church. The Palacios Hotel disposes of 85 rooms. Among other services, the establishment has car park, snack-bar. It also offers equipped lounges, perfect to hold conventions and seminaries with the entire guarantee of the success. A perfect establishment where you can start a visit through La Rioja from, the earth of the wines and beautiful landscapes.